You may have caught a whiff of freshly baked scones wafting through Tai Ping Shan Road from Teakha, Nana Chan’s popular and packed Sheung Wan tea house. In 2015, the more spacious Teakha Kitchen opened out west on Po Tuck Street in Sai Ying Pun, to the delight of HKU students looking for a chill spot to hang out at. Nana’s latest passion project, Plantation by Teakha, is a collection of fourteen craft teas sourced from small plantations around the world, selected by the proprietress herself. Plantation does not stick to just Chinese teas though, but rather “teas that we love.” From traditional varietals such as a floral Taiwanese Tieguanyin, a heart-warmingly toasty Kuki Hojicha from Kyoto, to original blends like Nana’s own masala chai with its aromatic Kerala spice mix, a must-order for most Teakha patrons. Nana’s favourite one from the current range is the White Peony, in the form of a pressed tea cake—a rather unexpected format for the most subtle (and healthiest) of teas. Hardened tea cakes are the usual form of peaty pu-erh, earthy, aged Chinese black tea. White teas, on the other spectrum, are generally in loose-leaf form — hand-processed using the youngest shoots with white fluff on them (hence the term) — to retain their delicately suggestive flavour. Except for the pressed tea cake, Nana’s selection of teas come in stylistic plum blossom-shaped cans wrapped in muted pastels, the paper packaging inspired by Chinese ink paintings and coloured with tea-dye by Italian artist Anna Cennamo. Plantation was launched at the Language of Tea exhibition at Space 27 in Quarry Bay in January 2017, in collaboration with well-known Hong Kong design maven and unabashed tea aficionado Alan Chan. Since the nineties, Alan has designed for countless tea brands, and even started his own tea houses in Hong Kong and Japan. Last year, he even collaborated with Louis Vuitton with his “Travelling with Tea” trunk concept. “Shouldn’t you say you only come for the ginger scones and our teas?” Nana responded. The veteran designer had proposed opening a tea shop together with Teakha’s proprietress before, believing in Nana’s vision, and stressed that her personality was really important for her brand. “So when I was wondering how to launch Plantation, I immediately thought of Alan, and asked if he wanted to do something fun together,” Nana said. 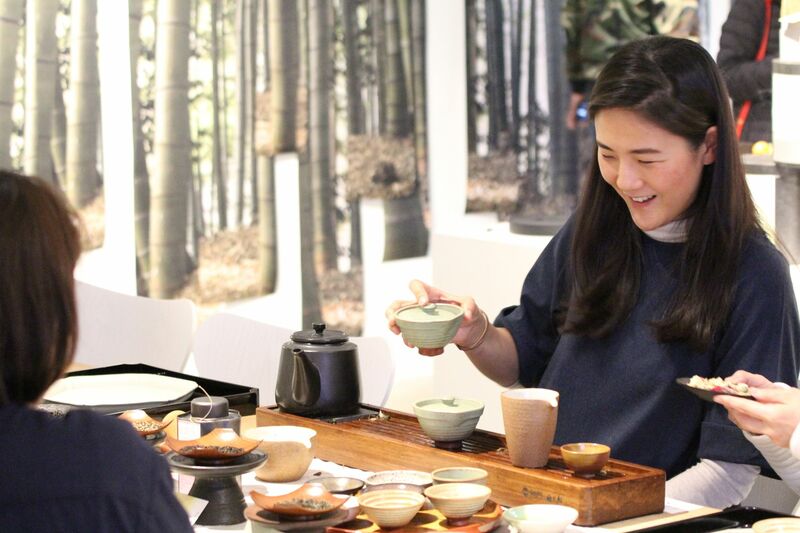 Their mission was to share “the endless possibilities of tea” and the exhibition went on for two weekends, with brewing lessons, a tea-dying station manned by Cennamo, as well as workshops for flower arrangement and calligraphy. To say that Alan’s seasoned curating skills added a touch of Zen to the opening reception is an understatement. It’s sometimes a disjointed affair when artists collaborate and egos clash. But woven around the gentler culture of tea, both Alan and Nana’s ethos of a contemporary style of Chinese tea appreciation echoed each other’s effortlessly. Alan’s impressive private collection of teaware from China and Japan was also brought out for all to see. Three towers of paper-thin porcelain, scintillating silverware, and rustic ceramic tea bowls from Kyoto transformed the event space into a splendid mini-museum. There was also teaware from local and mainland designers, including wobbly teacups (that do not spill) of black stoneware and porcelain with an unglazed exterior for tactile texture by Amanda Tong Ceramics. Alan also introduced Xiyan, a line of contemporary Chinese teaware of serene stainless steel from Suzhou. Ink black, matte and minimalist, the exquisite collection of tea stands, trays and braziers are produced a collective of Jiangsu artisans. Guests were invited to taste the different Plantation teas brewed by Nana herself and her expert team, and three kinds of cold brews were bottled as souvenirs: Osmanthus Oolong, Camomile and Red Jade with Bergamot Peel, a nuanced Taiwanese red with the depth of baked fruit infused with fresh citrus, like a Chinese Earl Grey. Most connoisseurs will say that tea is a lot more sumptuous, complex and profound than the posh, lush world of wine, or the hipster cool world of coffee, as correct tea brewing requires a human touch.